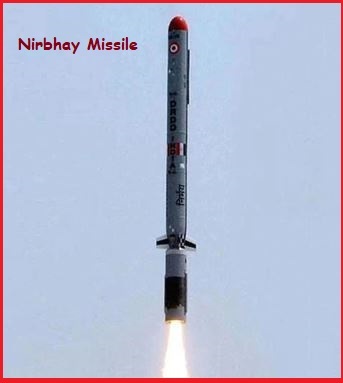 India successfully test fired ‘Nirbhay’, a sub-sonic cruise missile, off the coast of Odisha on16th April 2019. Nirbhay cruise missile is an all-weather missile and has been developed by Bengaluru-based Aeronautical Development Establishment (ADE), a lab under Defence Research and Development Organisation (DRDO) and can be launched from multiple platforms. It is designed to carry conventional and nuclear warheads. The 'Nirbhay' cruise missile subsonic long-range land attack cruise missile can be equipped with a 300-kilogram warhead. The 'Nirbhay' cruise missile which is nuclear-capable, has the ability to reach speeds of 0.6-0.7 Mach. The 'Nirbhay' cruise missile also has the capability to strike land targets at a distance of up to 1,000 kilometers. It's powered by a solid rocket booster for taking off and when it reaches the necessary velocity and height, the Turbofan engine further manages its propulsion. The 'Nirbhay' cruise missile is armed with a Ring Laser Gyroscope (RLG) based guidance, control and navigation system. It is also equipped with a MEMS-based Inertial Navigation System (INS) and the GPS system. The 'Nirbhay' cruise missile weighs 1,500 kg with a width of 0.52 meters and has a wingspan of 2.7 meters. As per reports, the missile can also deliver 24 different types of warheads based on mission requirements. The missile also has the ability to fly at low altitudes in order to avoid detection by enemy radar. The Nirbhay missile also has the capability of striking a target among multiple targets.